This last weekend was a great one for us in terms of finding great things for our antique space, mostly due to an amazing estate sale we stumbled upon on Saturday. In light of the fact that we’re moving into our new space on May 1st, Phillip and I had decided to forgo our usual weekend sleeping in to see if we could find a bookcase or two. We ventured out to one yard sale that seemed promising on Craigslist, only to find nothing at that address. Has that ever happened to anyone? Did they just decide they didn’t feel like having it after all or what? There didn’t seem to be much that seemed worth our while in town, so we decided to head for an estate sale one town over that was listed on Craigslist. 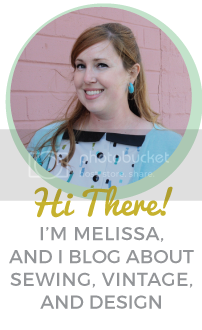 We arrived right at the start, and once we saw what they had to offer immediately looked at each other and said “maybe we should have brought more money.” There were piles and piles of amazing vintage at great prices. We started a pile on the “hold” table that grew larger and larger. Phillip spotted a vintage Turtle Wax barrel at a great price, and we decided to buy what we could and then go home to grab some more cash. The people graciously held the barrel for us and we returned and bought that and more. We even went back on Sunday and brought Phillip’s mom (and most things were half off!). We never did find a bookcase though. 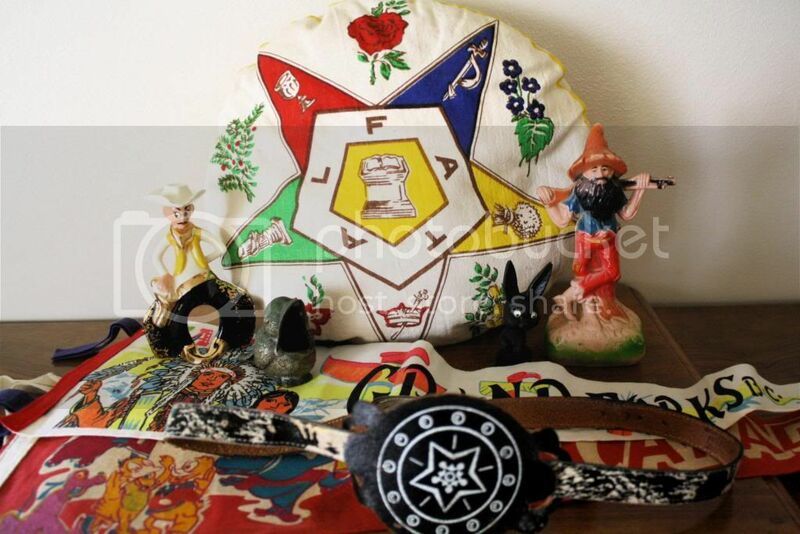 A Freemason motif pillow, a ceramic cowboy, a plastic hillbilly, a wide-mouth bird ashtray, a coal rabbit, some vintage pennants, and a 1950s child’s cowboy belt. 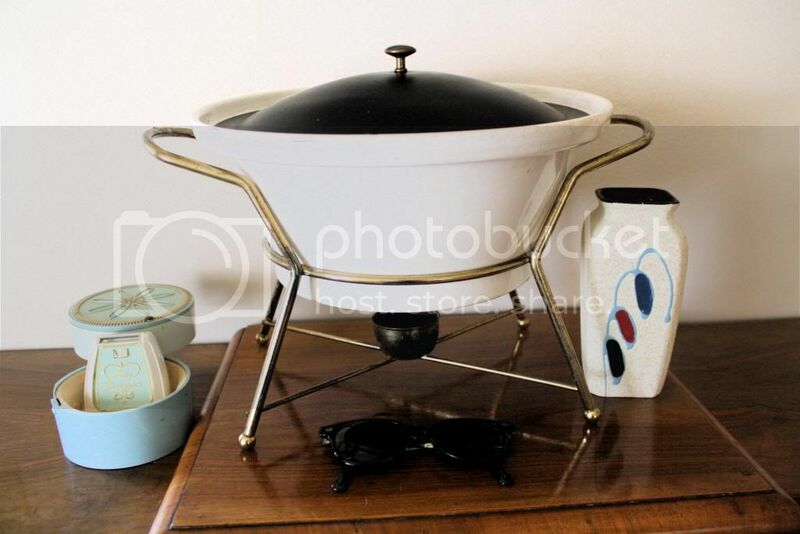 A “Lady Remington” shaver with the original case, a mid-century serving dish, a mod vase, and a pair of green sunglasses. 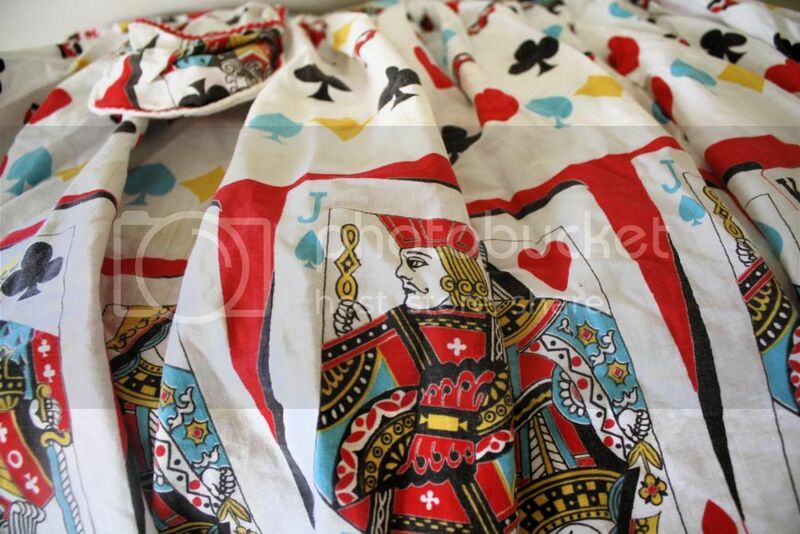 This is an apron made from an amazing playing card print fabric. I can’t wait to put it in the space with our Vegas-y stuff! 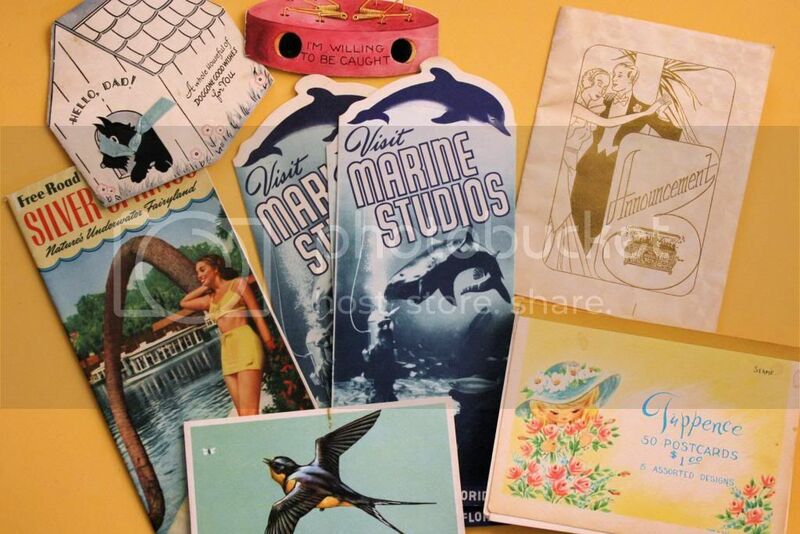 Lots of random paper goods- an adorable dog-themed Father’s Day card, a mousetrap valentine, a Silver Springs FL road map with a bathing beauty on the front, Marineland brochures, an announcement of the opening of “The Music Box” club in San Francisco dating from 1934, a gorgeous swallow postcard (which I will be keeping and framing), and a pack of sweet postcards from the 1960s. I was thrilled to see a table of vintage Christmas stuff. I headed right over and snagged these goodies: a cool silver bottlebrush tree, a bag of vintage gift tags, a Christmas hankie (maybe destined for another pillow? 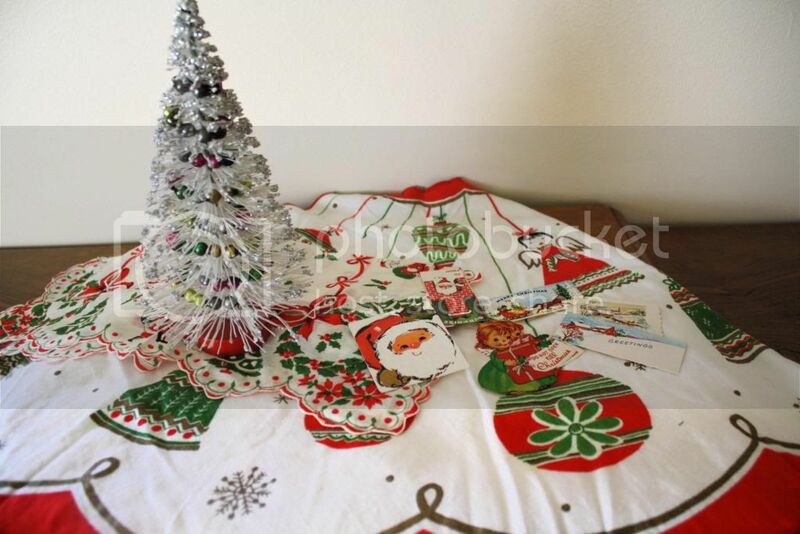 ), and this great tree skirt. 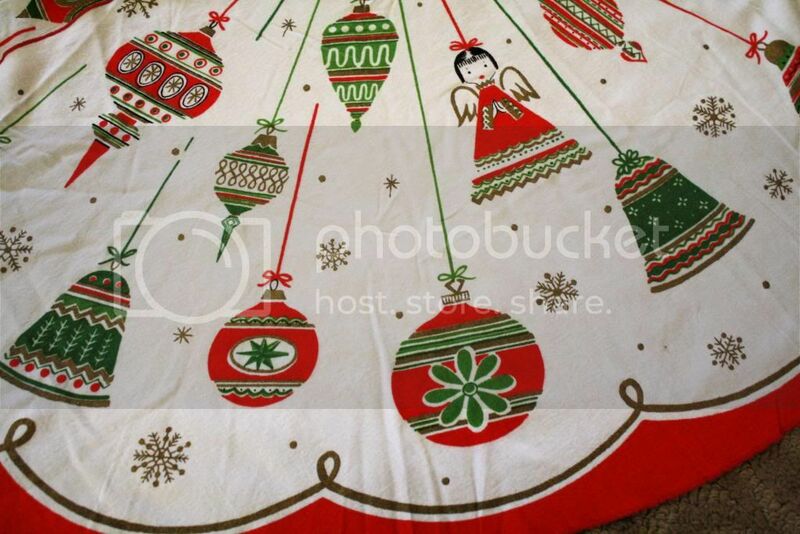 Here’s a closeup of the print on the tree skirt. Isn’t it adorable? It reminds me of the print on my Christmas Hankie Pillow. I am definitely keeping it and I can’t wait to see it under our tree next Christmas! 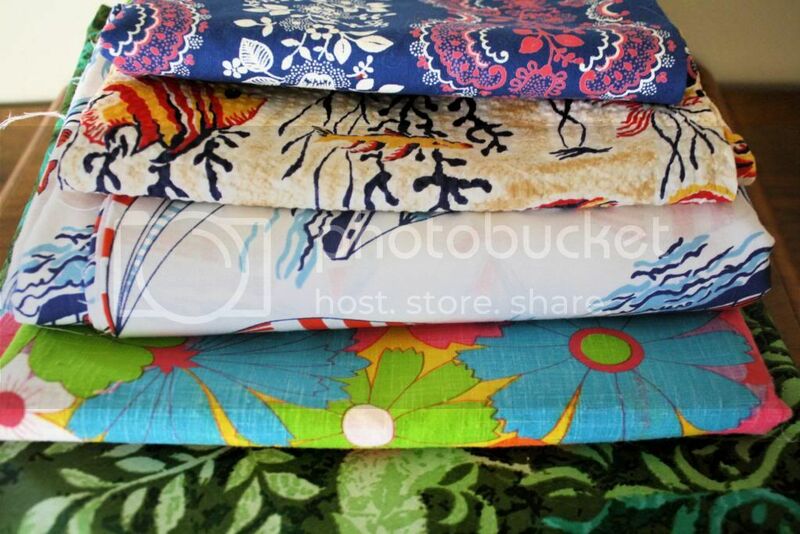 I also picked up a few pieces of vintage fabrics. 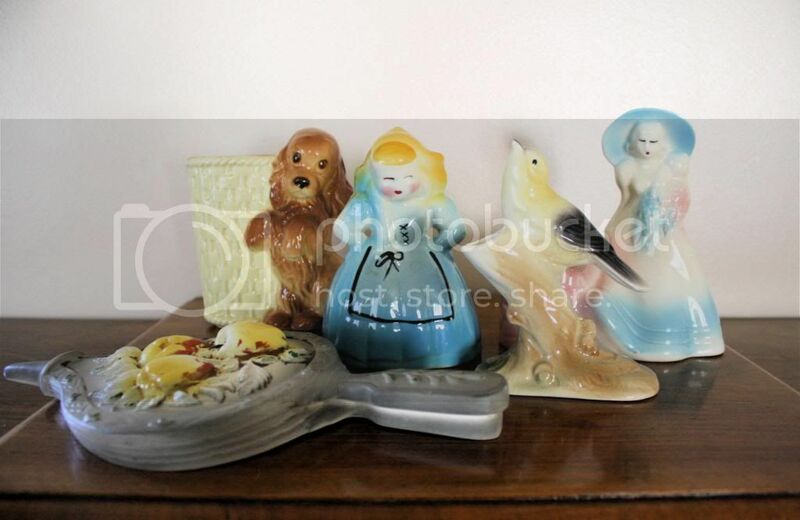 I’m putting all of these (except the top one) in the new space in a little vintage sewing section. We’ll see how that does! Have any of you who sell in antique stores had luck with sewing supplies? Here’s some “Magic Plastic Letters” (how cool is the box? 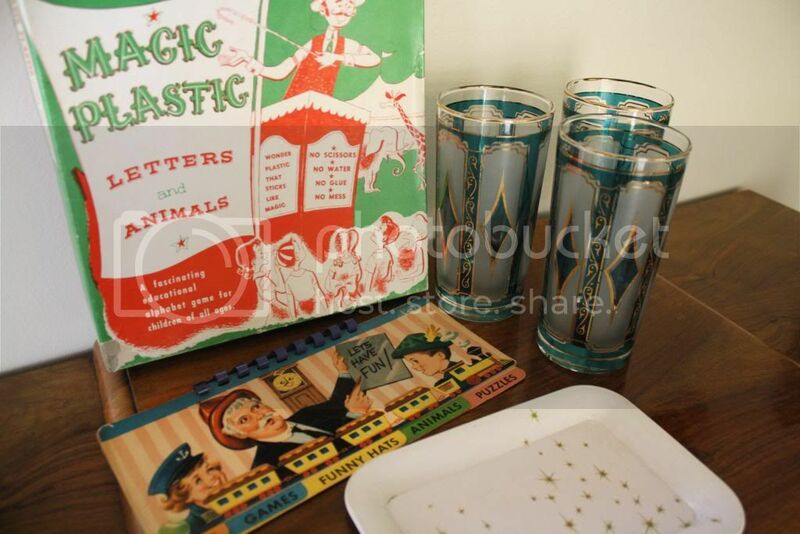 ), a set of sixties drinking glasses (there are eight altogether), a Captain Kangaroo book, and a little starburst tray. 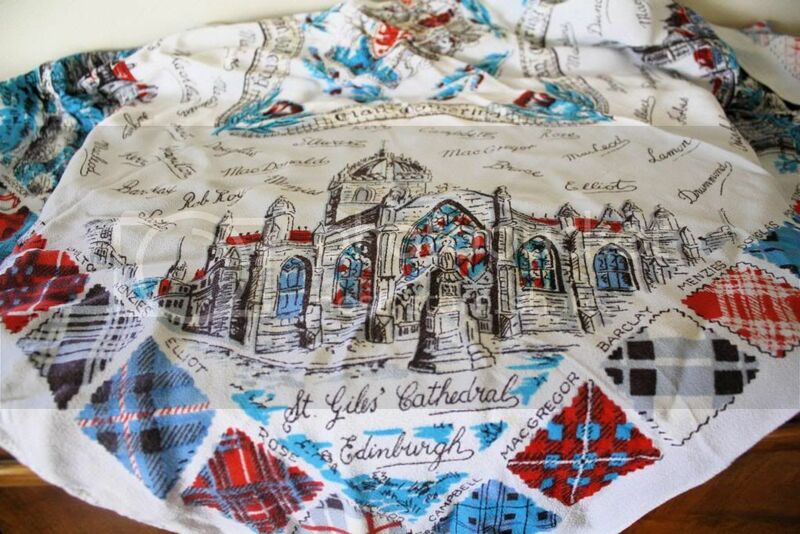 How cool is this Scotland-themed scarf? I love the tartans all around the sides. I’m debating whether this one would do better on Etsy or in the antique space. What do you think? 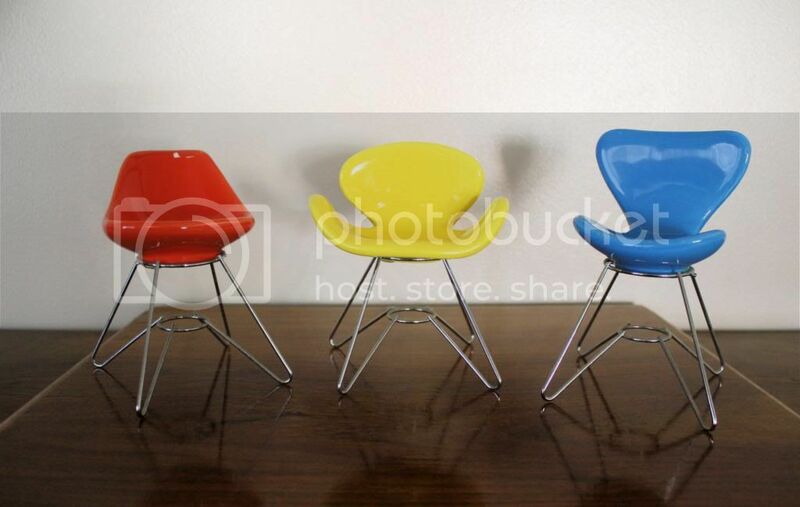 Unfortunately, the red one has a noticeable chip, but I think someone might dig them nevertheless. I’ll be trying them out in the space. Happy Thursday everyone! Can you believe it’s May already?! It’s going to be a good but crazy month for me. I’ll be kicking off my weekend at the Special Olympics meet on Friday and then I’ll be working like mad to get ready for the craft fair on the 11th and 12th. Oh, and my birthday is coming up next week! I’ve been so busy with everything I’ve had going on that I haven’t even had a chance to get excited yet. Not to mention my mom and sister’s birthdays, Mother’s Day, and our trip to Disneyland at the end of the month. Yikes! What are you up to in May? Any fun plans?